I know. I know. 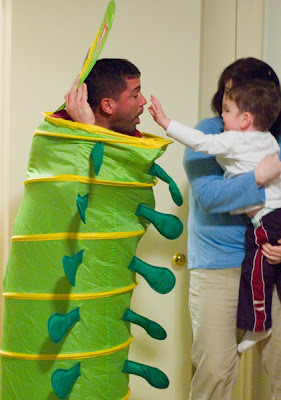 It looks more like a giant caterpillar than a deacon, but I promise it is. On Saturday, we had an open fellowship for anyone in our church to come by, hang out, have conversation, and a bite to eat. Justin affectionately labeled it the "Super Bowl of Chili Fellowship," but he was disappointed to find out that you don't really cook chili in a super bowl. After it was all said and done, we had over 30 people drop by from 3pm to 9pm, and served two crock pots of chili as well as some other good stuff. It was nice that some who had other plans were able to drop by earlier, and those who wanted to hang out a while were able to linger for a while. We had fun with members of our church of all ages. This photo of Brad is what happens when you send him into a room with 6 boys from 14 months to 4 1/2. Jonathan's room was definitely the place to be. And everyone marveled at how we have no girls. Brad says not to worry because if we have the boys, the girls will come. All in all, it was lots of fun and craziness, and we are so thankful that we now have a place where something like this is even possible. I choose pink because I'm hoping for a girl to play with Jonathan and for him to protect. However, we will take whatever God gives us and pray it will be healthy.